Their lineup for the night was filled with delicious beers, even some that Bryan was developing while he was at The Post. 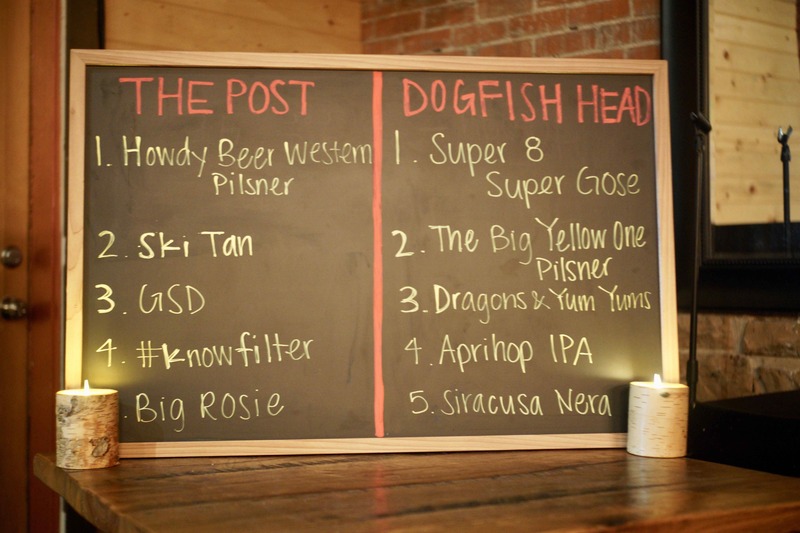 Upon arriving at The Post, we were welcomed with the first two beers: Dogfish Head’s Super 8 Super Gose and The Post’s Howdy Beer Western Pilsner. The two were paired with a rich and extremely delicious lobster roll. Each of the beers brings a unique pairing to the dish; one with an acidity that cuts the richness, and the other with a sweetness that embraces the roll. It was tough to pick a “better” pairing between the two, but this appetizer course was only just the beginning. The first course, and the first official pairing of the night, was titled Love Letter to Bryan Selders. The dish was a scrapple, made with a sunny-side up quail egg and a smoked tomato sauce. It was paired with Dogfish Head’s The Big Yellow One Pilsner and the Post’s Ski Tan. Each highlighted and complemented the dish in their own way. Ski Tan’s smokiness enhanced the smoked tomato sauce, and was balanced out by the scrapple. On the other hand, The Big Yellow One Pilsner complimented all the flavors of the scrapple. Essentially, the Pilsner would be a great breakfast beer to go with a traditionally breakfast dish. The second course was a seared scallop over an asparagus salad, with a spring vegetable salsa verde, topped with fingerling potato chips. This dish was outstanding and delicate. 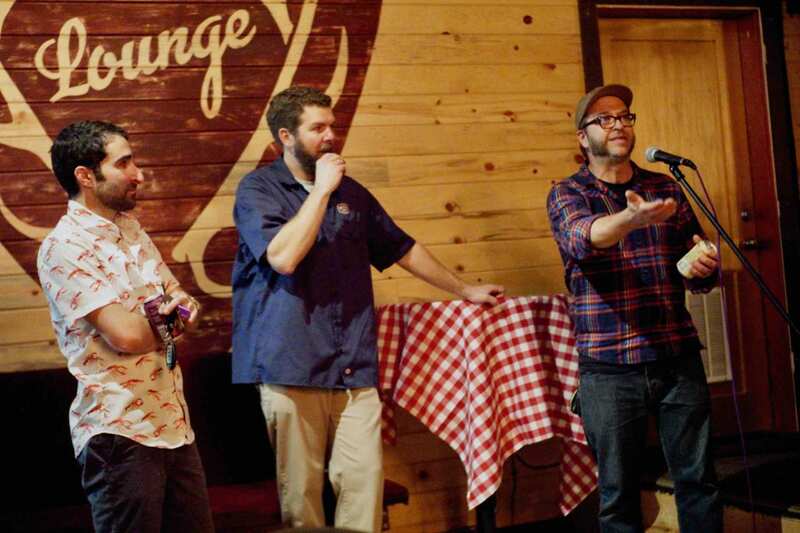 Bryan paired it with Dogfish Head’s Drangons and Yum Yum, which was part of their collaboration series with musicians. This particular beer was a collaboration with The Flaming Lips. Nick paired it with The Post’s GSD. 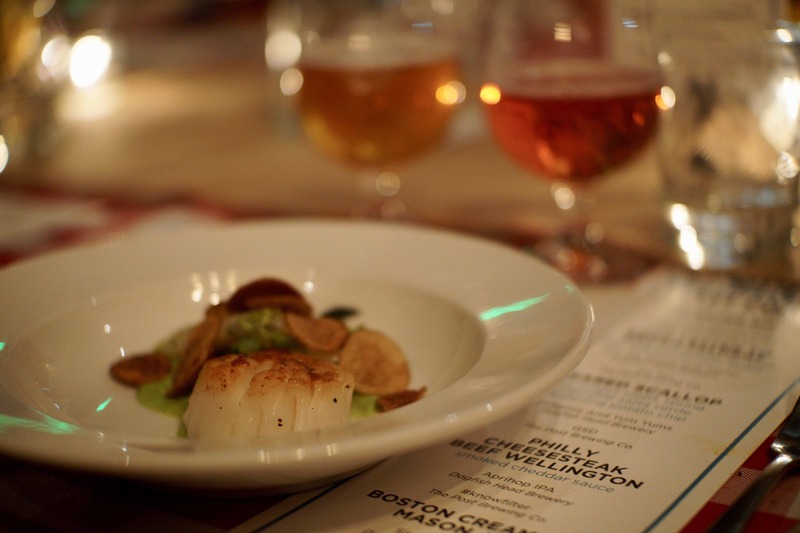 We enjoyed how the fruity notes complimented the scallops, We also enjoyed how the lightness of GSD embraces the delicate nature of the scallop, while adding some breadiness from the malt character. The third course of the night was a Philly Cheesesteak Beef Wellington with a smoked cheddar sauce. Like the other courses, it was absolutely delicious. 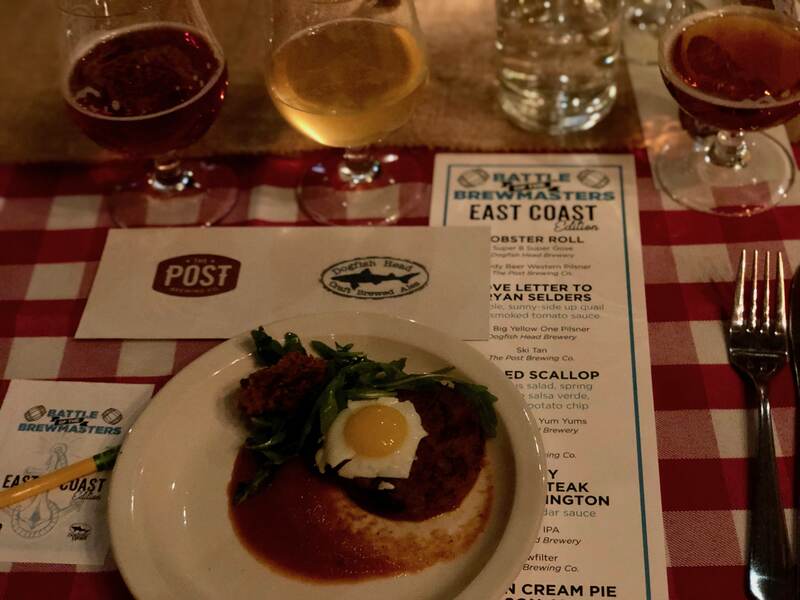 This course was paired with Dogfish Head’s Aprihop IPA, which is a classic, and The Post’s #knowfilter. Like the other courses that preceded it, each brought out different flavors of the dish. This was a round in which it was a unanimously difficult decision to pick which pairing came out on top. This was a great showcase of the Battle of the Brewmasters. The evening ended with the dessert course, which was a Boston Cream Pie in a mason jar. This was paired with Siracusa Nera from Dogfish Head and Big Rosie from the Post. 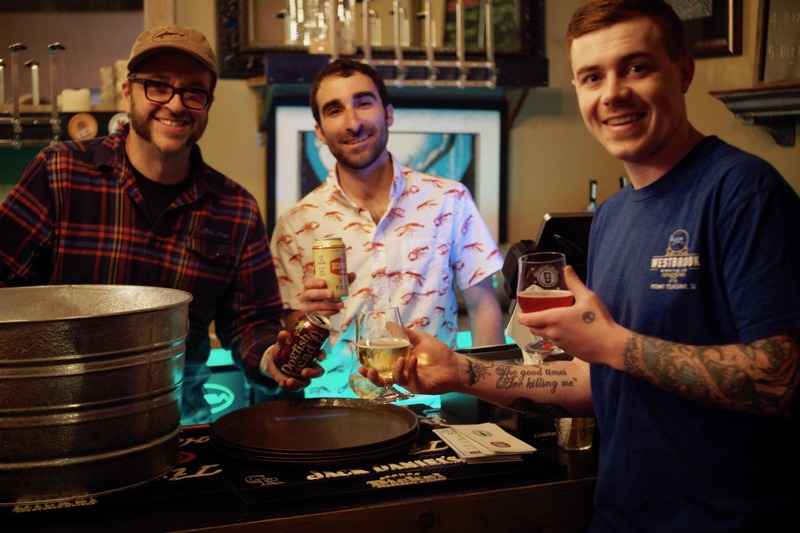 While describing the pairing, Nick shared that Big Rosie is one of the pastry chef’s favorite beers, so it was fitting to pair the Boston Cream Pie with this beer. 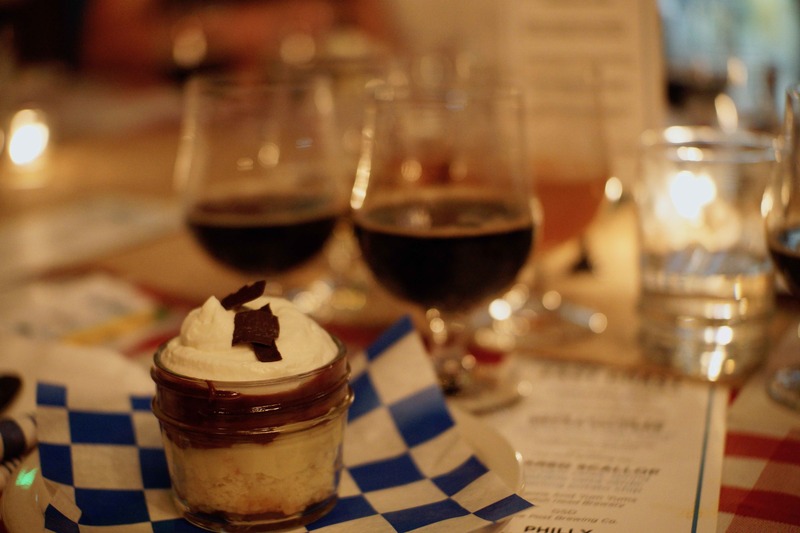 Each of the beers brought a unique pairing with the dessert. The wine flavors of Siracusa Nera enhanced the richness of the dessert. On the other hand, the coffee and roasty notes in Big Rosie balanced out the sweetness of the cream pie. It was tough to pick an overall favorite, since each beer brought out something different in each dish. The main highlight, I would say, is seeing the camaraderie and banter between Bryan and Nick. Not to mention, the thought process they went through to pick the beers that they paired Brett’s dishes with.